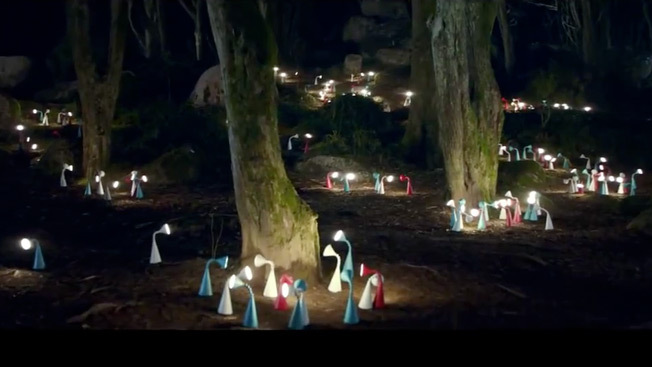 Ikea planted lots of LED lamps in the woods for this 60-second commercial for the U.K. and Ireland touting the home-furnishing company's commitment to sustainability. Created by Mother London and director Martin Krejci, the ad's surreal aura is enhanced by Menomena's pop-etheral "Wet and Rusting" on the soundtrack. Check out Mr. Squirrel's reaction as the lights blaze. Yeah, he's screwed—every predator can spot him now. The work provides "an opportunity to explain a little about who we are and what we stand for as a brand, and sustainability is a big part of this," says Ikea marketing manager Peter Wright. Some bright lights might point out that the ad displays enough timber to sustain hundreds of impossible-to-assemble dinette sets. (The company reportedly uses 1 percent of the world's wood supply each year.) But in fairness, Ikea has been working to meet ecologically prudent logging standards. So it's not like the company can't see the forest for the trees.